Japanese banknotes will be redesigned for the first time in two decades in 2024 with one of them featuring possibly the country's most iconic art piece in the world -- ukiyo-e master Katsushika Hokusai's "The Great Wave off Kanagawa," the government said Tuesday. The famous woodblock print from the "Thirty-six Views of Mt. Fuji" series by Hokusai (1760-1849) that depicts a large frothy wave with Japan's highest peak in the background will be printed on the reverse side of the 1,000 yen bill, Finance Minister Taro Aso said in a news conference. In the first design overhaul since 2004, Japan will also introduce new 10,000 yen and 5,000 yen bills with cutting-edge anti-counterfeiting protections. All of the three bills will be with portraits of well-known figures in Japan's modern history. 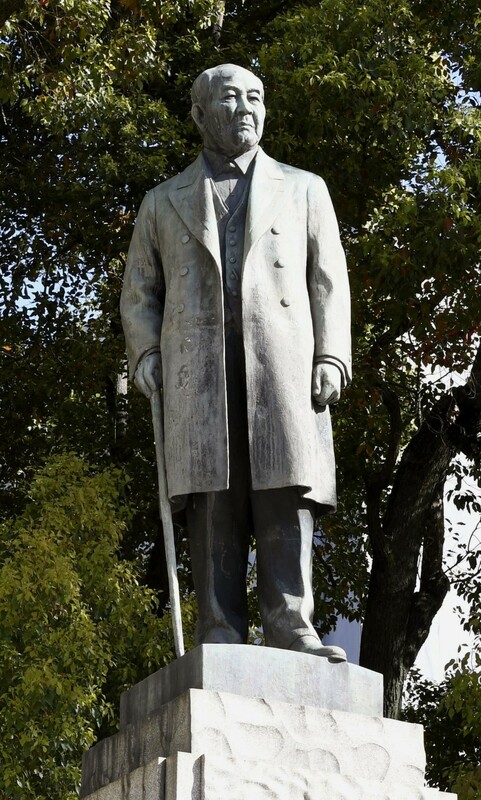 In order of value, they are industrialist Eiichi Shibusawa (1840-1931), who is widely known as the "father of Japanese capitalism," educator Umeko Tsuda (1864-1929) and physician and bacteriologist Shibasaburo Kitasato (1853-1931). The red-brick Tokyo Station building, which was originally built in 1914, and wisteria flowers will appear on the reverse sides of the new 10,000 yen and 5,000 yen bills, respectively. The announcement of the new banknotes comes as Japan prepares to usher in the new Reiwa era when Crown Prince Naruhito ascends the throne on May 1 following his father Emperor Akihito's abdication the previous day. "We will revamp the designs to ensure counterfeit prevention," Aso said, adding new materials will also be used for the 500 yen coin. In a bid to strengthen the notes' security, both the 10,000 yen and 5,000 yen bills will incorporate a hologram, the former showing a three-dimensional portrait of Shibusawa and the latter of Tsuda. 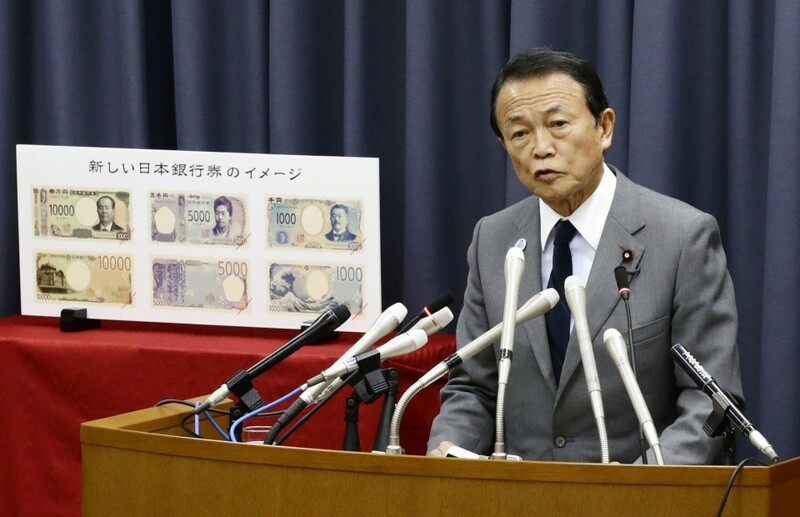 Aso said the three people appearing on the new banknotes were picked because they are well known in the country through history textbooks. "I believe they are suitable for Bank of Japan notes under the new era name for their endeavors in overcoming various challenges that we continue to face today, including fostering new industries, women's empowerment and technological advancement," he said. The new bills will be put in circulation in the first half of fiscal 2024 and the 500 yen coin in the first half of fiscal 2021. The Arabic numerals denoting the value of the bills will be larger than the Chinese characters that show the amount, unlike the current notes, to make them more instantly recognizable for those who are not able to read the characters, including foreign travelers. Shibusawa contributed to the establishment of hundreds of leading companies and the first modern bank in Japan, named The First National Bank, which is currently Mizuho Bank. Ken Shibusawa, a descendant of Eiichi and chairman of Tokyo-based Commons Asset Management Inc., told Kyodo News he is pleased to see Shibusawa "become widely known at home and abroad" through the new bill. Tsuda is remembered as a Christian and pioneer in education for women in the country. She established what is now Tsuda University in Tokyo. Kitasato helped discover a method to prevent tetanus and diphtheria and, in the same year as Alexandre Yersin of France, discovered the infectious agent responsible for the bubonic plague. The current banknotes feature educator Yukichi Fukuzawa (1835-1901) on the 10,000 yen bill, Meiji-era novelist Ichiyo Higuchi (1872-1896) on the 5,000 yen bill and microbiologist Hideyo Noguchi (1876-1928) on the 1,000 yen bill. Hidenori Suezawa, an analyst at SMBC Nikko Securities Inc., said the revamp of the banknotes could provide a positive economic impact as people might stop putting some of their money under the mattress, even on the back of prolonged low interest rates, in trying to get new ones.